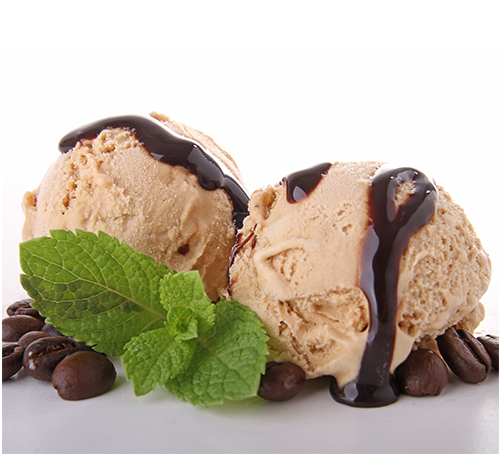 Sucralose is a new high quality intense sweetener, which is suitable for use in a diverse range of food products from carbonated beverages to baked goods. Sucralose is made from sugar and is an average 600 times sweeter than sugar. 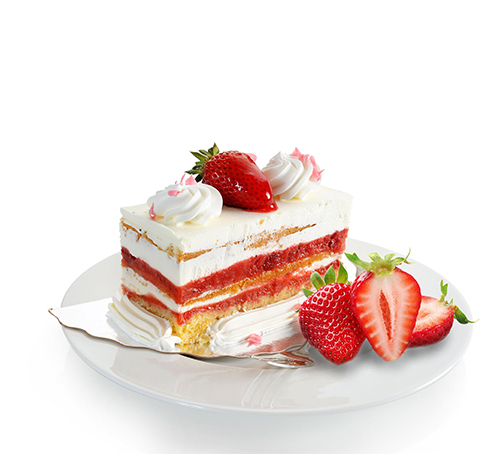 Sucralose maintains its sweetness even when exposed to high temperature food processing such as pasteurization, sterilization, UHT processing and baking. 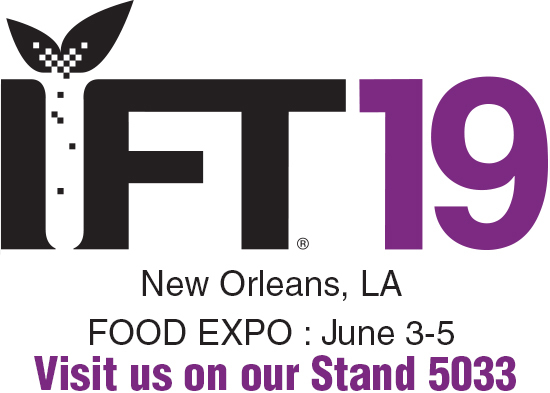 It is stable in food products throughout extended periods of storage, even at low pH. Sucralose is used around the world as an ingredient in the processed foods and beverages and in tabletop sweeteners available in super-markets and other consumer outlets. Solo Sucralose is derived from sugar through a patented, multi - step process that selectively substitutes three chlorine atoms for three hydrogen - oxygen groups on the sugar molecule. The tightly bound chlorine atoms create a molecular structure that is exceptionally stable. Bioplus is a family majority owned business with over 500 employees, multiple manufacturing sites with a growing global presence . Our products are focused on naturally sourced, renewable resource compounds validated by advanced science. Our focus is on licensed and OTC (nutritional) pharmaceuticals or healthcare products, novel drug delivery, excellence in carbohydrate chemistry and biopharmaceuticals. In 2008, AIF Capital, Hongkong, a leading private equity fund invested significantly in Bioplus Life Sciences to support an ambitious growth plan. Our 63 years of tradition, trust and reliability is supported by our desire to look further, take a long term view and be flexible in our understanding of changing needs. Our challenge in the next millennium remains to focus successfully on meeting the aspirations of our employees and our customers, whilst balancing our increasingly research driven environment. Our only competitive advantage remains to "Think Ahead" whilst not forgetting our humble past. Thank you for allowing us to share our future with you. The Solo plant is situated in Hosur, Tamil Nadu about 40 Kms from Bangalore, the capital city of the state Karnataka. The international Airport is about 70 kms from the plant and is well connected with roads. The Chennai port is about 300 kms from the plant and is also well connected by road and railway lines. The plant is about 14 acres in area which houses the Solo plant, QA & QC and R&D center. The plant is well equipped with utility requirements such as Boiler, Air Compressor, Chilling plant and RO plant. The plant is a zero discharge unit and the water and solvents are recovered and recycled. Sucralose makes a wide variety of calorie-reduced products possible, including soft drinks, ice cream, dairy products and baked goods. In fact, Sucralose is the sweetening ingredient in over 4,500 products worldwide, and may be used across a broad range of major categories. SUCRALOSE is the low - calorie sweetener made from sugar. It is used around the world as an ingredient in processed foods and beverages and in tabletop sweeteners available in supermarkets and other consumer outlets. Do products sweetened with Sucralose carry any warning labels or information statements ? No, none of the regulatory agencies and scientific review bodies that have confirmed the safety of Sucralose require any warning information to be placed on the labels of products sweetened with Sucralose. What is Sucralose made of ? Sucralose is derived from sugar through a patented, multi - step process that selectively substitutes three chlorine atoms for three hydrogen - oxygen groups on the sugar molecule. The tightly bound chlorine atoms create a molecular structure that is exceptionally stable. 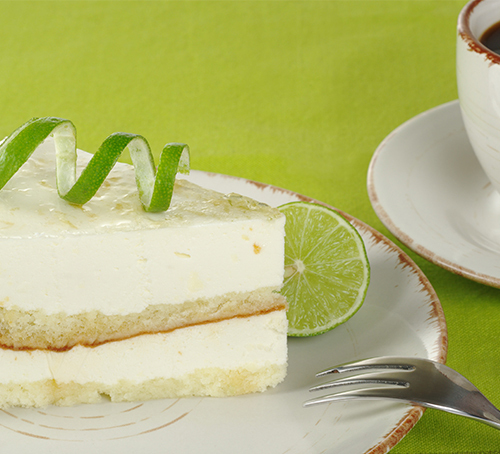 Sucralose has an excellent safety profile. More than 100 scientific studies conducted over a 20 year period demonstrate that Sucralose is safe for use as a sweetening ingredient evaluated by international experts in a variety of scientific disciplines, including toxicology, oncology, teratology, neurology, hematology, pediatrics and nutrition. Importantly, comprehensive toxicology studies, designed to meet the highest scientific standards, have clearly demonstrated that Sucralose is not carcinogenic. Does Sucralose provide calories ? Sucralose is non - caloric and thus, adds Low calories to the foods and beverages it is used to sweeten. Products made with Sucralose may contain calories from other nutritive ingredients that provide carbohydrates, protein and fat. How is Sucralose handled by the body ? Although Sucralose is made from a process that starts with sugar, it is not a sugar nor does the body recognize it as a carbohydrate. Sucralose is not broken down for energy in the body so it has low calories. The Sucralose molecule passes through the body unchanged, it is not metabolized, and is eliminated after consumption. Can people with diabetes use SUCRALOSE ? Yes, clinical studies have shown that Sucralose can be safely consumed by people with diabetes. Sucralose is not recognized by the body as sugar or as a carbohydrate. It is not metabolized by the body for energy and does not affect blood glucose levels. Sucralose has no effect on blood glucose utilization, carbohydrate metabolism or insulin production. Products sweetened with Sucralose provide good - tasting, lower - calorie alternatives for people with diabetes who are interested in reducing their caloric or sugar intake. As with any nutritional concerns, people with diabetes should consult their doctor or diabetes healthcare professional for advice on an individualized dietary plan. Is the chlorine in Sucralose potentially harmful ? No, Chlorine in the form of chloride is a safe and natural element present in many of the foods and beverages that we eat and drink everyday. It is in most natural water supplies, and is also found in lettuce, tomatoes, mushrooms, melons, peanut butter and table salt. In the case of Sucralose, the addition of chlorine to the Sucralose molecule makes Sucralose free of calories. Sucralose is an essentially inert molecule and it passes through the body without being broken down for calories. Is Sucralose safe for PREGNANT and NURSING WOMEN ? Yes, SOLO Sucralose can be used by everyone, including pregnant women and nursing mothers. Although Sucralose may be used as part of a healthy pre and post - natal diet, women who are pregnant or breast feeding should talk to their doctor or nutritionist about foods to eat to support their health and their baby’s health. The safety of Sucralose is well documented. More than 100 studies conducted and evaluated over a 20-year period substantiate the safety of Sucralose. Studies were conducted in a board range of areas to assess whether there were any safety risks regarding cancer, genetic effects, reproduction and fertility, birth defects, immunology, the central nervous system, and metabolism. These studies clearly indicate that Sucralose does no cause genetic changes and birth defects and is safe for PPREGANT and NURSING WOMEN. Is Sucralose safe for CHILDREN ? Yes, SOLO Sucralose can be safely used by everyone, including children. 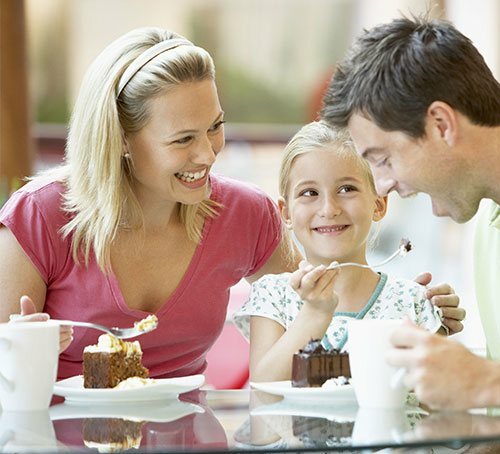 Sucralose can be a great addition to healthful meal plans designed for children’s needs. What is role of Sucralose in a healthful diet ? 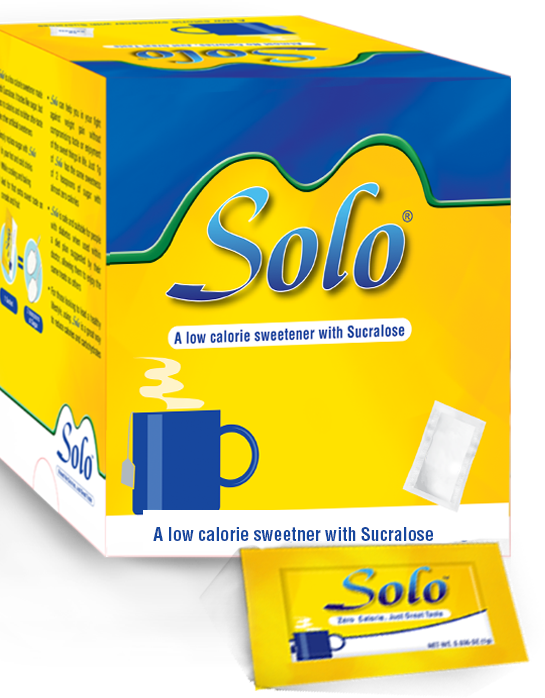 SOLO Sucralose can be used as a part of a healthy diet that includes a variety of nutritious foods in moderate portions. Because Sucralose tastes like sugar, has low calories and is ideal for cooking and baking, it helps meet consumer demand for good - tasting foods and beverages without the calories of sugar. Genetically Modified Organisms: Sucralose is not produced from ingredients or processing aids derived from genetically modified organisms. No animal derived ingredients are used in the production of Sucralose. 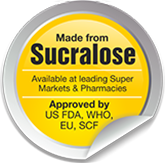 Sucralose complies with the relevant EU directives as on 1st September 2009. 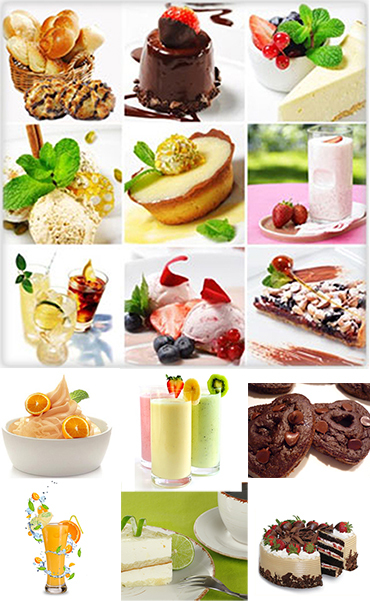 All raw material used are GMO free. All raw materials are in conformity with EU directive of regulation (EC No: 1823/2003).